TOP 10 PICK - RECOMMENDED!!! "This neat, crowd-pleasing little musical...it’s cheerful and amusing, the cast of five is attractive and lively, and Ronnie Marmo directs with panache!!!" "TUNEFUL, HEARTWARMING, AND HYSTERICALLY FUNNY!!!" "A FIVE STAR HIT! 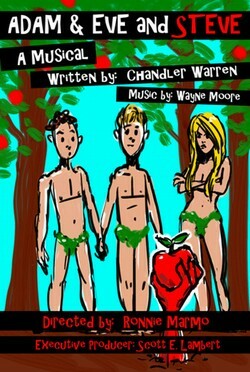 Warren’s irreverent musical farce is snarky, gay, zany, outrageous, relevant and extremely funny." "A humorous take on the biblical version...If it sounds schlocky, believe me, it isn't...the ensemble, it's a winning combination of five great triple threat performers." "A sparkling gem...cute, charming, creative, filled with laughs and some beautiful songs. The cast of five were perfect. A world premiere musical farce based on Biblical Adam and Eve story, which is interrupted through the Devil’s interfering so that Steve is added to the mix to create a lot of fun, mischief and struggle. The three of them get tangled and fight to unwind as they all try to figure out the many definitions that love has to offer.